A true Hurricane at heart, Lamar Thomas escaped the hostile environs of Gainesville to become one of the most accomplished Hurricane receivers of all-time. A rare four-sport letter-winner at F.W. Buchholz High School (football, basketball, baseball and track), Thomas was named All-State in football and basketball. Lamar was also named Florida Player of the Year by both the Tampa Tribune and the Gainesville Sun. Miami Coach and UMSHoF member Dennis Erickson couldn't possibly know that the "Torretta to Thomas" combination would one day help lead the Canes to amazing heights. As a redshirt freshman in 1989, Thomas saw limited duty. He caught 15 passes for 205 yards and his first Hurricane touchdown, a 7-yard reception against rival Florida State, would start a trend that would hold true throughout his Miami career. Lamar set a school record (since tied) for most receiving touchdowns in a game, when he and UMSHoF member Gino Torretta hooked up for three scores against Texas Tech in 1990. That season, Thomas would catch 43 passes for 742 yards, tying for the team lead with 6 TDs, and leading the squad with an average 17.3 yards per catch. He had 3 games with over 100 yards receiving (BYU, Kansas and Notre Dame). Lamar would become a consensus First Team All-BIG EAST selection in his junior campaign where he led the team in receptions (39), yards receiving (623) and touchdown receptions (6). He had two 100-yard receiving games and added 5 catches for 73 yards in Miami's 22-0 Orange Bowl Classic victory over Nebraska for the 1991 National Championship. In 1992, Thomas tied UMSHoF member Horace Copeland with 47 catches for 701 yards and a team leading 10 TDs. He had three 100-yard games and his 33-yard score against FSU, his third career TD against the Noles, put the Canes ahead for good in the game better known as "Wide Right II". He was named a consensus All-BIG EAST First Team member for the second consecutive year. Lamar left Miami as the school's all-time leader in career receptions (144, now 2nd), second in career receiving yards (2,271, now 4th), second in career touchdown passes caught (23, now tied) and sixth in career total TDs (23). His 10 touchdowns in 1992 were the second most in a season, now tied for second. 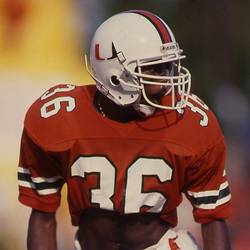 He also tied UMSHoF member Michael Irvin's streak of 33 consecutive games with a reception (now tied for 2nd). With the passage of time, Thomas' numbers may have fallen on the Top 10 charts, but the legend of "Torretta-to-Thomas" will always remain in Hurricane hearts. An all-around athlete at UM, Lamar played several games for basketball coach and UMSHoF member Leonard Hamilton's basketball Canes in the 1990-1991 season, and competed in track, winning the 1992 BIG EAST Outdoor High Jump Championship (6'-7 1/2"). He was taken in the 3rd round of the 1993 NFL Draft (60th overall) by the Tampa Bay Buccaneers and spent eight seasons in the league with Tampa Bay (1993-1995) and the Miami Dolphins (1996-2000). Thomas returned to Miami and received his Bachelor of Liberal Arts degree in 2008, then started a career as a football coach, first in high school, and currently as wide receivers coach at Louisville.